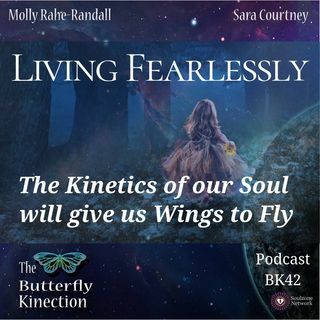 In this final episode in the Living Fearlessly series, Molly and Sara talk about how this series and the entire podcast as a whole has helped them to realize that they are ready to live fearlessly in what they want to do in their solo journeys. They discuss what this podcast has meant to them, what gifts it has given them, and how it has helped them to learn and grow spiritually. They also talk about where they plan on going with their spiritual practices and business endeavors. Molly and Sara ... See More discuss the meaning of their motto “The Kinetics of Your Soul Will Give You Wings to Fly.” They came to a great realization that they are capable of ending something in a positive way. They talk emotionally about how other experiences in their lives ended negatively and how that affected them. Molly and Sara will continue to use the Butterfly Kinection website and social media platforms to post anything they are doing individually or together. Sara’s blog, Waking Up Sara Marie is a blog about her own personal struggles, successes, and her awakening. She hopes to share her experiences with the world to inspire change and help us all to wake up. To learn more about Sara’s new endeavors and services including Soul Builder Sessions, follow Sara on Facebook and Instagram @WakingUpSaraMarie and also join her Facebook group Dragon Warriors: Conquering the Fear and Anxiety Within. Molly’s new solo podcast, Soulfessions, will be airing soon. To learn more about Molly’s services including Soul Movement Coaching, Vocal Coaching, Sound Vibration, and mediations, you can follow her on Facebook and Instagram @TuneinWithMolly. This may be the end of the season for The Butterfly Kinection, but it is not the end of our journey with you. We hope you will join us as we embark on our solo endeavors and in any future series brought to you by the Butterfly Kinection. Many Blessings and thank you! Sign up for our Free Soul Reflection Challenge (https://soulreflectionsacademy.teachable.com/p/soul-reflection-challenge-tbk) and follow along with The Butterfly Kinection’s complete season of 42 podcast episodes. Each episode and journal exercise are meant for you to use to reflect inward and spark movement within your soul. For more of The Butterfly Kinection, follow on Facebook (https://www.facebook.com/groups/TheButterflyKinection/learning_content/), Instagram (https://www.instagram.com/thebutterflykinection/?hl=en), Pinterest (https://www.pinterest.com/thebutterflykinection/). To stay up to date on any of our solo endeavors, special offers, new products, upcoming podcasts, and new classes, please continue to visit our website, www.thebutterflykinection.com.